Over the past few years, turmeric has skyrocketed in popularity in the West, as many health food enthusiasts, scientists and natural doctors come to recognize the remarkable properties of this ancient spice. Here are just a few reasons you should add turmeric juice to your diet today! Curcumin is one of the main reasons for the many health benefits of turmeric. This compound (which is abundant in turmeric) is essential in reducing chronic inflammation that leads to excessive pain and swelling in the body. Curcumin inhibits multiple pathways of inflammation and has even been shown to be more effective than over-the-counter non-steroidal anti-inflammatory drugs such as ibuprofen for pain reduction. Along with ginger, turmeric is one of the best natural means for improving digestion and alleviating painful symptoms such as bloating, heartburn, constipation, and gas. Turmeric has been shown to cause the gallbladder to release bile, which is an essential step in healthy digestion. Cancer can strike at any moment, so it is essential to take preventative measures that decrease your risk factor before you develop this dangerous disease. Once again, curcumin is the star player in turmeric’s cancer-prevention abilities. This compound helps eliminate free radicals in the body and can reduce damage to cellular membranes. Turmeric has been shown to reduce the risk factor for numerous types of cancer including prostate, breast, lung, liver, oral, skin and colon cancer. Considering the fact that heart disease is the number 1 cause of death around the world, it seems like a good idea to take care of that oh-so-important muscle. Along with a healthy diet and regular exercise, turmeric has been researched as a potentially viable tool in improving heart health and potentially reversing various cardiovascular disease. Curcumin can improve endothelial function which is essential in preventing heart disease, excessive clotting, and regulating blood pressure. Arthritis is characterized by excessive inflammation in the joints. Inflammation reduction, as mentioned above, is one of the primary benefits of the curcumin compound in turmeric. Numerous studies performed on those with arthritis have noticed significant relief when patients were treated with high levels of curcumin. In fact, one study showed that curcumin was even more effective in reducing inflammation in those with rheumatoid arthritis than an anti-inflammatory drug. Unfortunately, it can be a little tricky to incorporate turmeric into your diet, and even a liberal amount of the ground spice is only so effective. To reap all the benefits of turmeric, try juicing the root for a fresh elixir that is easy to make and packed full of nutrients. Wash about five large pieces of turmeric root in warm water. You should be able to find turmeric root in most grocery stores. Peel the root. You will probably notice that your fingertips and nailbeds turn orange from the strong color of the root. When you are finished making your turmeric juice, simply scrub your hands in warm water and soap for a few minutes. The stains should come out. Run turmeric roots through a juicer. If you don’t have a juicer, you can simply blend the roots and a little bit of water and use a fine strainer or cheesecloth to collect the juice. Repeat the juicing process with the pulp at least two more times to make sure that all the liquid is extracted. You can store this juice in a glass jar in the fridge for up to 3 days. If you want juice with a little more kick and other beneficial ingredients added in, try this turmeric elixir. Spoon 3 tablespoon of your fresh turmeric juice into a jar. Add the juice of about 2 lemons. This amount can be adjusted according to taste. Add in 2 tablespoons of local raw honey. You can skip this step if you prefer to avoid sweeteners. Add 1 tsp freshly ground black pepper. Black pepper helps the benefits of curcumin from turmeric absorb into the bloodstream. Finally, stir in 2 cups of cold water. Seal the jar and shake well to combine. Enjoy within 3 days to avoid spoilage. You can serve this juice with a fresh sprig of mint if desired. 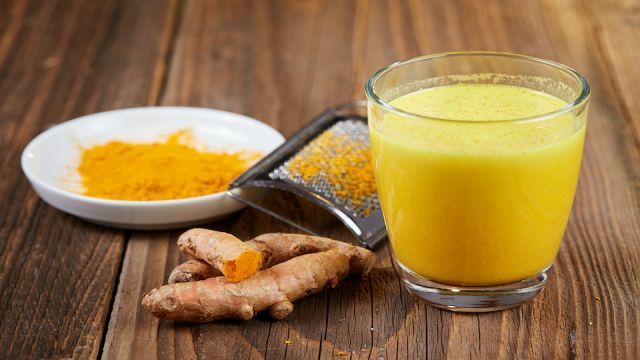 Have you ever made your own turmeric juice? Let us know in the comments below!